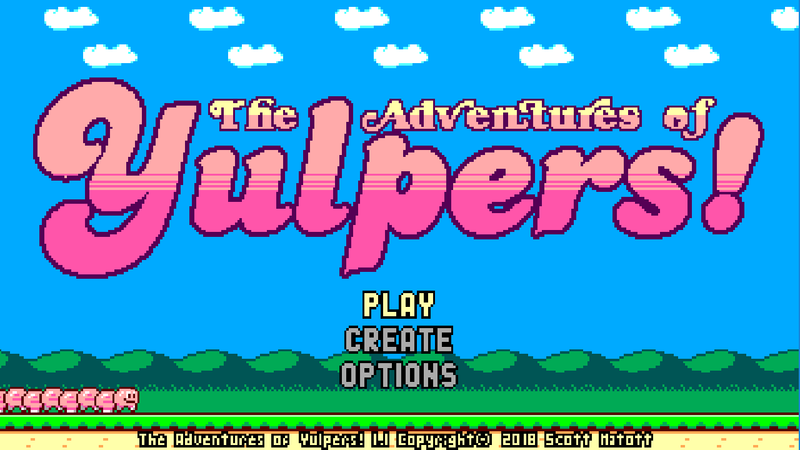 It's time to yulp your way to fame and glory with The Adventures of Yulpers! The more you yulp, the longer you get, but watch out for the sinister Gulpers or you'll get gulped! 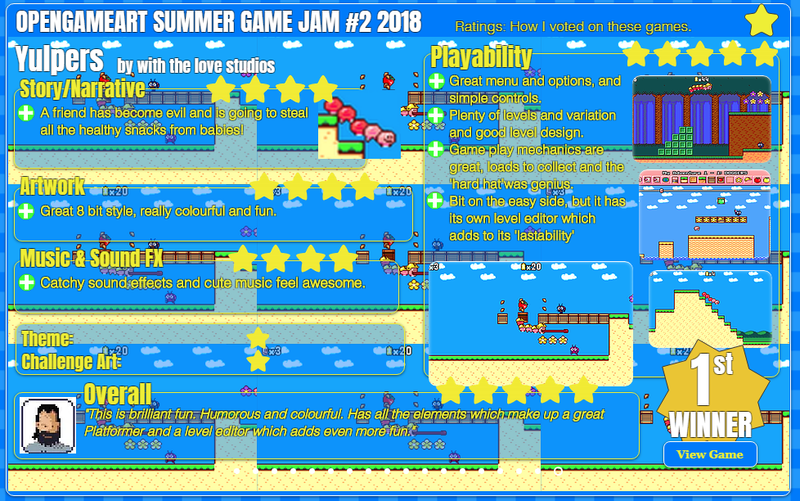 Hop, bop, jump and yulp you're way through sixteen levels of adventure with Yulpers in this delightfully colorful retro platformer created for OpenGameArt.org's Summer 2018 Game Jam! But don't stop with the built-in levels, create your own adventures for Yulpers with the included and fully featured level editor! 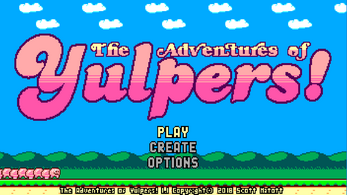 Created with the love and gobs wonderful art and music from OpenGameArt.org, Yulpers is sure to a bring a smile to even the most hardened gamers, so grab a controller or keyboard and get ready to YULP! 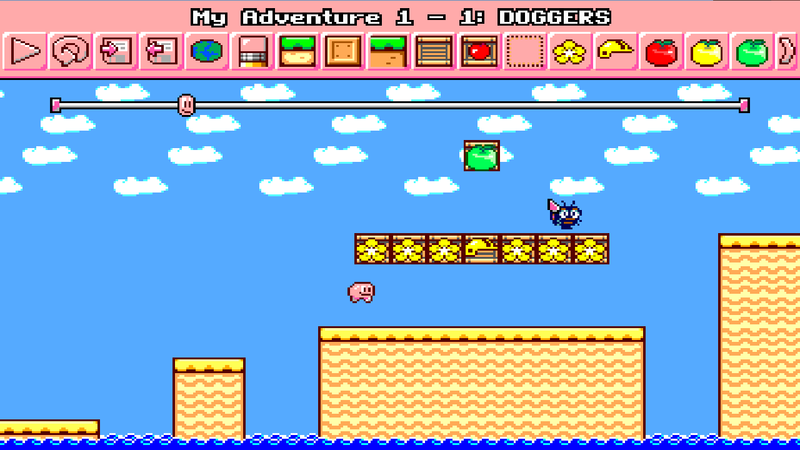 Mouse required for level editor. Fixed bug that caused game to repeat same song over and over instead of playing a different song for each environment. Fixed bug that caused mouse pointer to jump around when it was moved offscreen in fullscreen mode. Windows Display (DPI) Scaling disabled at startup (window resolution exactly matches resolution player selects). Video options default to fullscreen mode. Bug fix: Random vertical lines no longer appear when running in 1366x768 and 1360x768 resolution on Nvidia cards. Mosiquito speed/difficulty tweaked (made slower/easier). Errant helmet removed from 2nd grassland level. Scroll speed for title and credits backdrops tweaked (slowed down). Errant pixel cleanup for title text and grass backdrop. 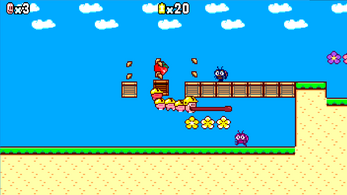 Credit added for 'Good Fruits' by Master484. 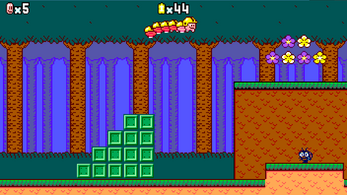 Credit added for 'Celta World NES Version' by Snabisch. 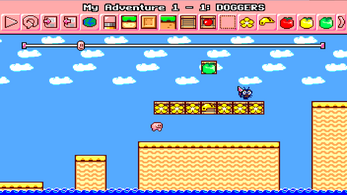 Credits removed for unused assets ('Around The World NES Version' and '2D Pixel Clouds'). Menus respond to yulp and jump buttons (previously they only responded to yulp button). The Adventures of Yulpers is Copyright Scott Matott 2018. All rights reserved. Thanks for making this collage, I love it! thanks! Video was a fun watch, glad you enjoyed the game! It was a very fun game to play, feels very complete. 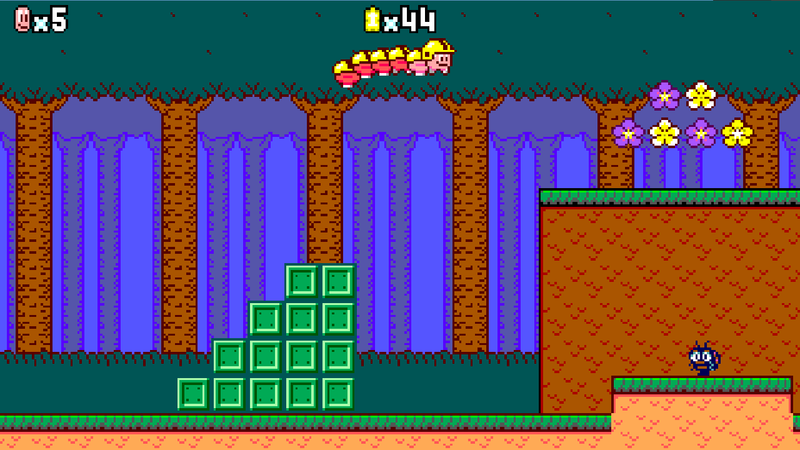 The idea to have a growing centipede (or whatever Yulper is) as a platformer character is really great, one of those "why hasn't this been done before and if has, why haven't I known about it?" kind of ideas. 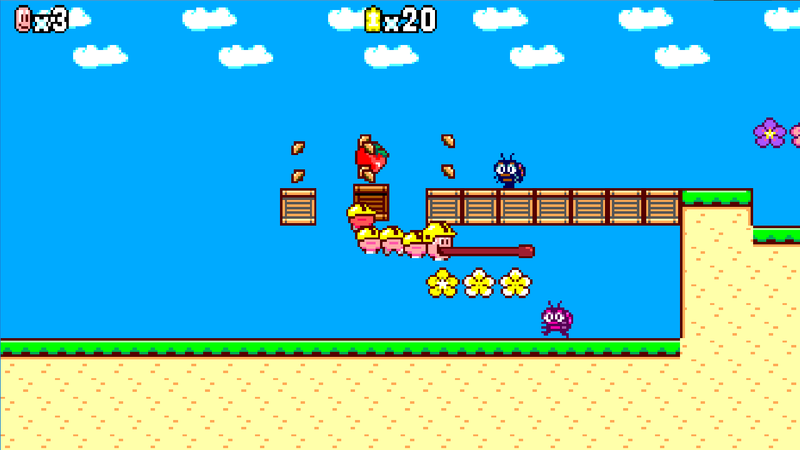 It takes some elements from Super Mario Bros. in the visuals, but I think the music is a bit more newer style, which is nice, I guess. 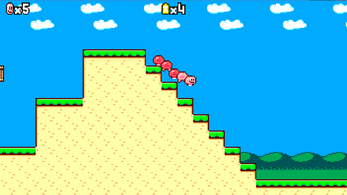 Unlike many old games, this game starts easy and the difficulty picks up slowly. I lost my first life on the fourth level and that was because I fell into a lava pit. The level editor is another great feature of this game. 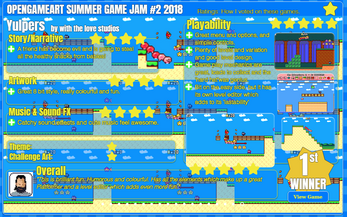 Thanks for checking out the game and for all your kind words! 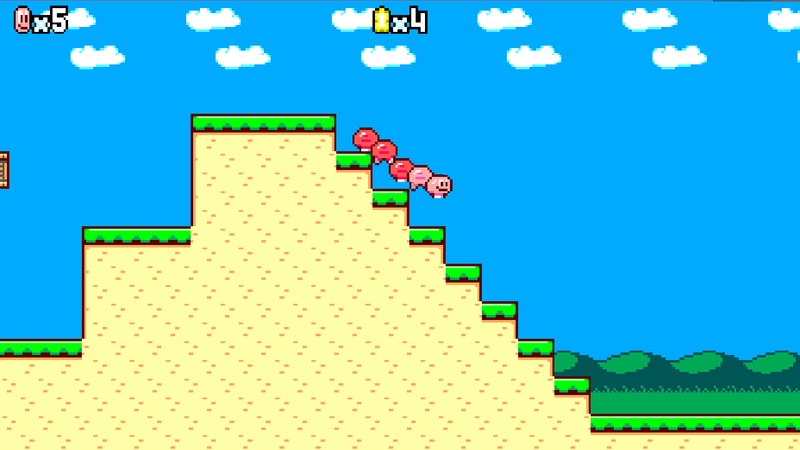 Will definitely look into the GDWC. Definitely have a bunch improvements I'd like to make to the game and a special 'World Championship Edition' might be just the excuse I need to do it. Okay, that sounds great! Thanks for your interest! Simple, effective, and fun. Great game!